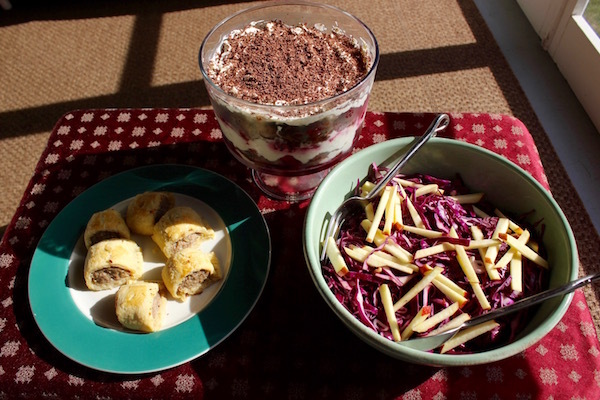 Sausage rolls, a red cabbage salad and a chocolate-berry trifle make for the perfect make-ahead Boxing Day lunch. We had a fright after realizing the servants would be off on December 26; we had invited everyone we know to an open-house for Boxing Day. Scarier still was the discovery that we didn’t have servants in the first place. Boxing Day began in the great British manor houses, when the folks upstairs gave the folks downstairs a break on the day after Christmas—24 hours off. That’s not all, Mrs. Patmore, Mr. Bates, sweet Anna and vengeful Thomas—the whole Downton crew through the ages—got boxes filled with presents, tokens of appreciation for devoted service, perhaps even a farthing or two. The servants didn’t get off that easily, though. All kinds of cooked meats and delicacies—veal in aspic, anyone?—had to be prepared in advance to be dished out by a skeleton staff on the 26th. At some point in the early 20th century, when the vast majority of Brits also realized they did not have servants, the best of the holiday remained (banks and schools closed) with none of the fuss (hold the aspic, pass the sausage rolls). America’s celebration on December 26, Returning Presents Day, is not at all similar. When you buy sausage rolls in the U.K., the dough is almost always puff pastry. When making our recipe, you can save time by picking up a package of pre-made puff-pastry dough, but make sure it’s a high-quality brand from a gourmet place and not the standard supermarket fare. But why buy store-bought at all when our buttery homemade dough is so much better? Not only that, the rolls themselves (about 24) can be refrigerated for up to two days before serving or frozen for later. They are delicious cold and can be reheated in the oven (20 minutes at 350 degrees). You’ll never buy a slice of pizza again. Place sausage meat in a large bowl and add the onion, thyme, and parsley. Refrigerate until ready to assemble. (Sausage meat should be cooked within 24 hours of purchase.) Pulse flour, salt, and butter in a food processor until the mixture resembles coarse breadcrumbs. Slowly add ice water as you continue to pulse until forming a soft dough (add a bit more water if the mixture is dry). Turn mixture onto a floured surface and gently press dough into a square. Cut dough into two thick pieces, cover with cling wrap, and refrigerate for at least two hours or overnight. Place one square of pastry on a floured surface and roll out into a 24 x5-inch rectangle. Rotate dough 90 degrees to face you lengthwise and trim the rough edges. Take half the sausage filling and lay out a long strip about two inches wide, a little less than an inch from the closest edge. Brush that close edge with some of the beaten egg, then gently fold the far edge over the meat to form a roll, pinching both edges together to seal. Trim off excess dough, leaving a ½-inch edge of pastry. Crimp the edge with a fork and cut the roll into 12, two-inch pieces. Place each roll on a greased baking sheet and lightly brush the tops with beaten egg mixture. 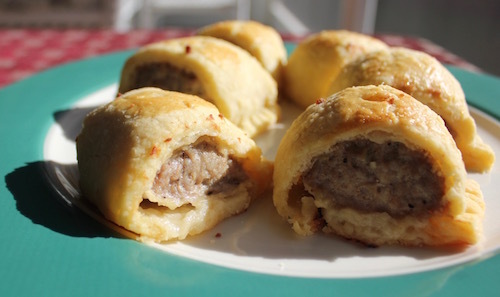 Bake rolls in a 375-degree oven for about 25 minutes until tops are golden brown and sausage is cooked through. Cool rolls on a wire rack for an hour, then cover and refrigerate until ready to serve. Repeat with remaining dough and mixture. 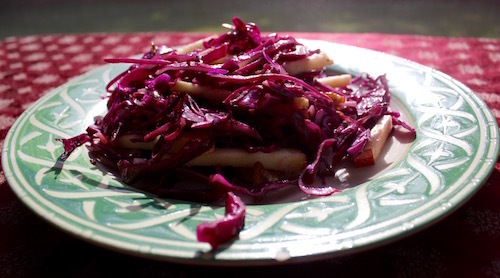 The dressing can be prepared up to eight hours in advance, and the cabbage shredded, but the salad itself should be finished, assembled, and dressed right before serving—a light, bright companion to all kinds of rich holiday fare. Whisk mustard, vinegar, and preserves together in a small bowl, then slowly whisk in the two oils. Set aside. Preheat oven to 350 degrees. Place walnut pieces on a heavy baking tray and toast in the oven for five minutes, being careful not to let them go beyond light-brown. Set aside to cool. Place all salad ingredients in a large serving bowl, add salt to taste and a few grinds of pepper. Mix thoroughly. Pour in enough dressing to lightly coat; toss to combine. No household would be without its showy glass trifle bowl, proudly on display for the holidays. 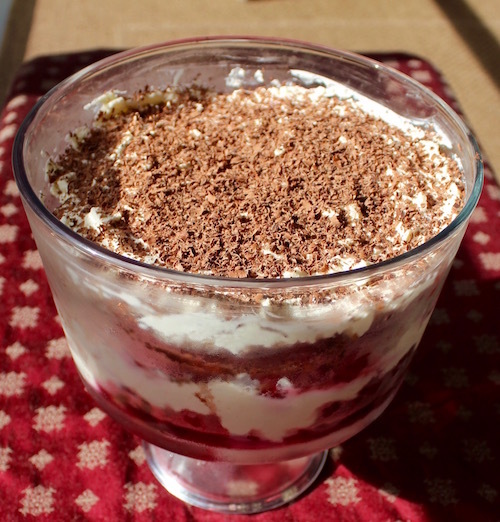 This version of trifle isn’t hard to make; it just takes a while. We have fun concocting this multi-layered confection a day ahead—in fact, it’s better that way. Feeds at least a dozen hungry lords, ladies, and servants. Preheat oven to 350. Grease a 13×9-inch baking pan and line it with parchment paper. Place chocolate in metal bowl and melt over a pan of simmering water. Set bowl aside to cool. Place egg yolks and sugar in a large bowl and whisk with electric mixer on high until yokes are pale and doubled in volume (about five minutes). In a separate pan, beat egg whites on high until stiff (mixture should stay in place with bowl turned upside down). Using a rubber spatula, gently fold the melted chocolate into the egg yolks. Stir two tablespoons of the beaten egg whites into the chocolate to lighten. Gently fold in the rest of the egg whites and pour onto a baking pan. Bake 10-12 minutes. Remove from oven and set aside to cool. Mixture will puff up and then settle as it cools. Place a sheet of parchment paper (slightly larger than the chocolate roll) on the counter. Sprinkle evenly with two tablespoons of cocoa powder. Gently flip chocolate roll onto dusted paper and peel off the original parchment paper. Spread blackberry preserves evenly over surface. Using parchment paper underneath for support, gently roll up the chocolate sponge. It will break and crack but keep going; the parchment will hold it together. Compress the roll with the parchment and place in refrigerator for about an hour to firm it up. Place mascarpone, heavy cream, sugar, and vanilla extract in a large bowl. Whisk with electric mixer on high until the mixture has a thick mousse-like consistency. Refrigerate until ready to assemble. Place blackberries in a heavy pan with water and three tablespoons of sugar. Simmer over low heat for five minutes. Cool and add raspberry liqueur. Place in the refrigerator to chill. Put raspberries in a separate bowl, stir in two tablespoons of sugar, and set in fridge. Sprinkle a cup of raspberries on the bottom of a trifle bowl or any deep glass bowl and cover with a thin layer (about ¾ cup) of mascarpone cream. Unwrap and cut the chocolate roll into 10 thin slices. Place five slices on top of the cream mixture. Spoon over half the blackberries and juices, followed by a cup of raspberries and half of the remaining cream, all in an even layer. Add the remaining chocolate roll slices in a single layer, spoon over the remaining blackberries, letting the juices soak into the cake, followed by the rest of the raspberries. Top with a thick layer of mascarpone cream. Cover with cling wrap and chill for at least 24 hours. To serve, coarsely grate a thick layer of dark chocolate over the top. Alison Boyd ran a catering business in her native London before working as a private chef in Bridgehampton. 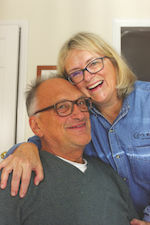 She has since decamped to the North Fork where she cooks frequently with William Sertl, Culture Editor of the Beacon and former travel editor of Saveur and Gourmet magazines. Every Thursday, before their spouses arrive for the weekend, they dine out and plot their next home-cooked meal.